IS IT REALLY ABOUT FEAR? When I saw this graphic in an Internet atheism community, my first thought was this: is it really about fear? First of all, the reality is almost all of us have been taught to fear death. It’s certainly an effective way for parents to do all they can to make sure their children don’t consider suicide, no matter how troubled they might be. Secondly, most of us fear death because we can’t be certain what, if anything, lies beyond it. Will we vanish into nothingness? Return as an aardvark? Become a ghost and haunt annoying relatives? Because of these two points, many people, especially angry agnostics or atheists, make declarations like Ann Druyan (an agnostic author and TV documentary producer). So I return to my original question: is this this graphic really about fear? I suggest it’s about something else: obeying what our culture decrees about faith and ignoring everything else. Our culture says whoever has the most toys when he/she dies wins. Our culture says don’t think about anything spiritual – go shopping. Our culture says regard anyone who has a real faith in God with suspicion. Our culture says get a face lift, get botox treatments, dye your hair, wear tons of makeup – whatever it take to look young and immortal. He died on a cross to make up for all the bad things I’ve done and the good things I’ve failed to do. He rose from the dead after three days, thereby wiping out the permanence of death. These gifts are offered to every person on this planet, no matter who they are, where they live or what they’ve done. All we need to to is accept the gifts. Does this make sense to you? Do you see what Jesus did as a gift that takes away the fear of death? Yes or no, type your thoughts below and let’s have a conversation. Because I believe in Jesus’ resurrection, I have no fear of death. I’ve heard it said that you truly can’t live a fulfilling life until you’ve rid yourself of any fears about dying. Our bodies die, true, but our souls live on. Blessings, Frank! I have had a huge amount of trouble dealing with this accusation from the atheist community. The accusation being that Christians only do good works to appease God out of fear, and that we only (or primarily) believe in God out of a fear of the afterlife/hell etc. It seems they either just don’t get it, or there is a NEED not to get it. 1 – Atheists come from a different world-view line of thought. While that in itself is not wrong I find a common thread in their thinking is they simply cannot comprehend someone doing something simply to “do good” without expectation of reward, or believe simply because that is what they believe — no fear involved. The problem then is one of transference and an inability to understand another person’s view of life. 2 – In some cases the “fear” angle is simply a straw-man argument that an atheist will cling to in order to more easily put down the Christian they are dealing with. It’s lazy but since so many atheists accept the argument they get kudos and high-fives from others in the atheist community and the concept feeds upon itself. I feel no fear of dying, I do not believe out of fear and I do not do good works out of fear. this is greatly puzzling and I think sometimes scary to atheists. Uhm…that is exactly what atheists (or at least Secular Humanists) DO think. Everything an atheistic Humanist does is without the expectation of eternal reward. Everything an theistic Christian does is with the expectation of eternal reward. You have it completely backwards. And unfortunately, you have to deal with the fact that many Christians claim they perform their good works in the name of God, and would not do so otherwise. Many of them also question whether atheists can perform good works without belief in God. All of this is moot, however, since Frank never actually addressed the point of Druyan’s quote, which was not about fear but about fairness. 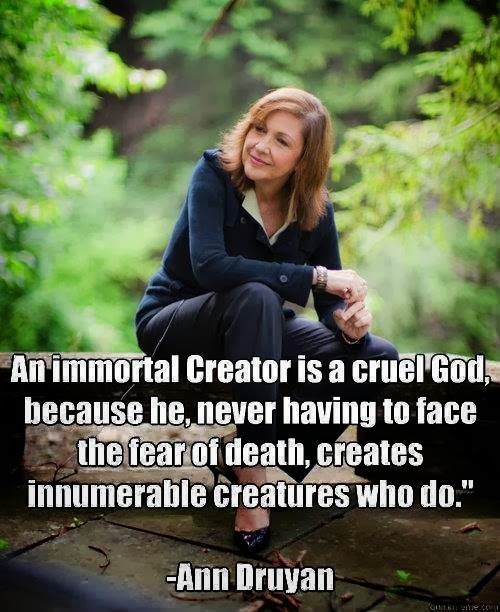 Was it just of God to create creatures that suffer death while never having to endure it himself? Serious Christians believe that God did, indeed, endure death when He allowed Roman authorities to put his Son to death. In addition, Frank’s Cottage is not meant for atheists; it’s written for people who are open to spirituality. I think what frustrates atheists is being treated as if any activity they choose to undertake that benefits their fellow human beings is automatically evil, since they do not profess a belief in God. I have had several conversations with atheists about the nature of good vs. evil and what does one use for a moral compass when lacking a Christian Bible, Koran, Torah, Sanskrit or other ‘holy writings’. One in particular sticks out in my memory: the person was offended by the contrast between ‘God doesn’t make junk–you are His creation’ and ‘you are worth less than the worm in the field since you are broken, helpless, incapable of anything good or worthwhile without His presence governing every breath you take’. I couldn’t address the chasm between the theological rock and dogmatic hard place and chose discretion as the better part of valor. What would YOU say to such a person? (IMHO, the victim of some very damaging religious abuse). I’m well aware that there are Christians who do what they do and believe what they believe out of fear. I also know MANY who do not. I’m sure there are also atheists or Secular Humanists who do things altruistically and those who only expect personal reward for almost everything they do. People come in all shapes, sizes and personalities. I don’t approach conversations with an assumption that I know what drives the other person. Sometimes I may have suspicions or theories but I don’t see how I can assume that I know their motives. The problem I encounter with atheists VERY regularly is one of assumptions of what drives me and why I do what I do. Almost every time I try to explain that I don’t think that way, the atheist will then try to PROVE to me that I do in fact think and behave how they assume I do! As for this — “Everything an theistic Christian does is with the expectation of eternal reward.” Let me explain it to you this way. If I had a particular car in my possession and I knew it could never be stolen or lost or removed, would you assume, in any way shape or form, that everything I do is to gain that EXACT same car? I already have it, I don’t need to do things to gain it and I don’t need to do things to keep it. I might polish it and keep it in good shape but those actions would be simply because I feel I should do them, not for any reward or fear. About Ann Druyan’s comment. Honestly, I don’t even know where to begin on that. It’s a really stupid comment. Fear and pain and evil and justice are all human constructs. We decide what we fear, what is painful and what is evil and when justice is served. To transfer those concepts to a creator and assume he is cruel because he doesn’t feel the same way we do is preposterous. just some musings- if evolution ( survival of the fittest / living just to pass on one’s own genes) is all there is to our lives, then altruism would not seem to make sense- not to say you cannot be altruistic in one does not believe in God. If we are made in the image of a loving God , then altruism makes sense.